The Gentleman Crafter: Hello From Texas and the F1 Races!!! Thanks for the kind wishes for my tooth recovery! LOL! The pain has gone away and I am feeling much better! Yahoooo! I still need to go back in three weeks and have part 2 done. The crown! I guess you all wondered what in tarnation I had been doing the last few days. Well, honestly for a few days there I was resting. The pain killers do a whopper on me and I literally want to sleep! But through it all, I had a boatload of deadlines that I had to meet and last night I finally turned in my last project! THANK YOU! Done! Now its back to some free time to create some new projects! I have so many cool things I'm thinking about. I can't wait to get started on CHRISTMAS! Boxes! Minis! 3D stuff! Altered stuff! Inky Stuff! Yahooo! With a four day holiday coming up next week, surely I can get a good start! Tonight, I was just getting my bearings back. I know it's funny huh? I've been crafting like the dickens but, they were bigger projects and tonight I just wanted to work on a few smaller projects to get my mojo going. By now you might know what relieves the tensions and frustrations of daily life...pulling out my Creative Art Journal and doing a page in it. Wooosh...The world and it's problems go away and I am in bliss. There are two things that make me happy...Cutting chipboard and now spraying inks! I've been in heaven as I have done both tonight. So I wanted to share with you a couple of things I made. First up is a video I did on a simple Christmas place card holder for the Christmas Table....Easy Easy! That's it for tonight Gang! Guess I better hit the hay. Work tomorrow morning and then CRAFT TIME! Yahoo! Night Y'all, Thanks for coming by! omgosh..I could sit and watch her forever making such pretty pictures! I love yours, as well! So neat! Glad your mouth is feeling better...have a great time crafting on your 4 day weekend!! Loved Dyan's video, thanks so much for sharing! While I am a HUGE fan of hers, in this case .... dare I say it ... I like yours better! But then again, I am a very quirky person! Glad you are feeling better! Cool journal page! I'll watch Dyan later ( I'm cross eyed now and I really want to see this... I'm going to go take a nap... it's 2:15 a.m. , I'll be back up at 7:00 a.m. ). I love watching Dyan work! hi! I am a new follower from Greece! I like your work so much! And the videos you make are awesome! Art journaling is great even though I have not tried it yet! I would also like to ask about the distress ink carousel I saw on one upload on you tube. Where can I get it? (international shop). Love the tag line on the post, you covered the entire family with the F1 reference! Actually we live in Michigan and took all 3 kids to Indy when F1 was there every year for the races. We'd go for 3-4 days spend all of the days at the track, the kids have pictures with F1 TV personalities and even got to meet and greet many drivers. It's an amazing people event even if you don't get pulled into the excitement of the races. Everyone is friendly, talkative, it's very colorful in every sense of the word, lots of interesting things to find in the tent areas. It is an international event so expect to hear many languages; go ahead and strike up a conversation it's a great experience. People watching at its' best (people with country flags on, costumes for their favorite team, the annual ferrari car hat guy, etc). Just make sure you take ear protection if you go, water to keep hydrated, and a camera to take lots of pictures. That place card holder is beautiful. What paper is that? Love it love it love it. Love, love love the place card holder! Good to see you feeling better...Happy Thanksgiving! Love the place card holder. Neat trick with the scoring. 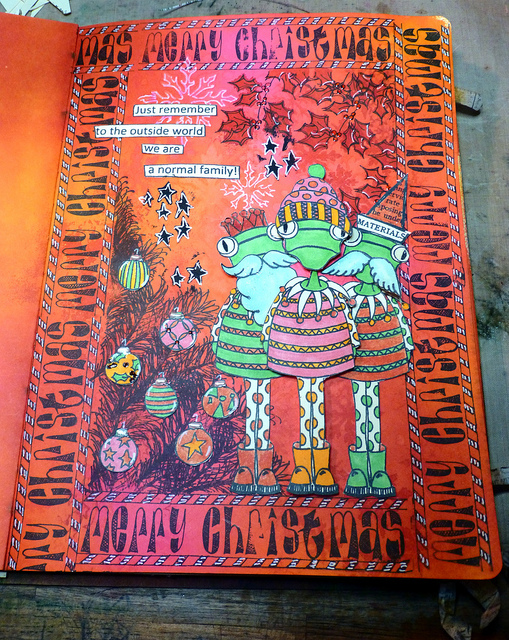 Your Christmas journal page is so fun. Thanks for sharing. Hey Jim....glad to hear you are feeling better and back to your old crafty self once again....luv the place card holder....really was quick and easy to make...appreciate you sharing and looking forward to more tutorials! Good to hear, Happy days, no more pain, and no more drugs. The tip about scoring the chipboard is such a time saver, I think I will make these to label the food table. Thank you for posting Dyans' videos. Wow, now I am on the hunt for the evergreen branch, what a clever tree. Really elegant place cards, thank you so much for the instructions. I am always so impressed with your creations. The scoring with the blade to create the professional folds in the card stock is very helpful. Thanks. I love, love your Christmas page. Your people are adorable. Oh you guys...June Marie asked me what paper collection I used for the Christmas Place card holder..It's Tim's, Tim Holtz Idea-ology Paper stash- Holidays Past. WOW - what can I say? Thanks for sharing both the placecards and Dyan's videos, they are so colourful and quirky. I didn't think I would need one of her journals, but now I'm having second thoughts and understand why they are the size they are! Oh and really like the three characters you've put on your page. Once again you inspired me. Inspired me to shop. Dag-nabbit Jim! I was suppose to stay home today & clean. Amazingly, no one has said anything about the house. Hmmmmm, maybe I "can" clean every other week. Thanks for the inspiration! That's a fun place card holder! What a cheerful page! Thanks for sharing it! I was happily spraying tags today with Dylusions, and getting my fingers nicely inky. It's amazing what a mess yu can make if you don't watch where the nozzle is pointing--well, at least it was away from my clothes! LOL! Very clever!! Thanks for the video. I learn so much better when I can watch how you make your projects. So glad you linked Dyan's videos...again...love watching how things are made....she makes everything so fun. I'm in Albuquerque taking classes from Dina Wakley....lots of Dyan's stencils and sprays...having a blast!!! Oooooh! Jim, by Jove, I think you've got it!!! This page is fabulous! I LOVE IT!!!! Hmmmm...I responded via my phone...Wonder why It didn't post! Poop! Sorry about that Mark! When I'm doing a project that really needs to hold up, I use Scor-Tape around the edges and then run it throughout the Xyron. The Xyron's adhesive will not stick to the Scor-Tapes backing. Normally I just use the Xyron to cover chipboard. That really neat project... She seems to do really interesting work. I like your piece you did. It funny and cute all at the sametime. I love your name card project - I need to get that die now! Thanks for the links to Dyan's videos too, she's fascinating to watch in action. I like your version of her journal page too. I have those seasonal word stamps and the one you've used is one of my favourites!